Titanium mining in Thuan Nam district has caused health and environmental damages, while consuming scarce groundwater, needed for daily living and agriculture. Villagers strongly oppose the mining activities. In August 2012, the provincial People’s Committee of Ninh Thuan province approved a titanium mining permit for the Quang Thuan company, covering 83.7ha in Son Hai 1 and Son Hai 2 hamlets of Thuan Nam district. Since then, the mining activities have caused significant environmental pollution and have led to serious health problems, such as respiratory inflammations and eye diseases, provoked by dust and sand pollution. Further impacts include drastic reduction of groundwater sources and drying up of wells due to the company’s tapping of water sources for ore processing. The growing lack of water has negatively affected the daily life of villagers as well as agricultural production in the region . In the context of these negative environmental and health impacts, the titanium mining operations have provoked large opposition and uprising of locals [1;2]. Following many complaints, and in response to the company’s lack of a license to use groundwater sources for ore processing, a temporary suspension was ordered in 2012. The provincial government demanded from the company a new Environmental Impact Assessment as well as the establishment of clean water facilities for the local populations. In early 2013, the company was allowed to continue mining activities on a small area of 19.32ha, given they would control environmental pollution . When the company was going to fully resume its activities on March 19, 2014, however, in absence of the required clean water facilities, it was reported that around 700 villagers gathered in front of the Phuoc Dinh commune’s governmental building to voice their concerns and opposition [3;4]. Some of the protester were alleged of mobilizing the gathered villagers to set fire to the company factory and equipment [1;4]. 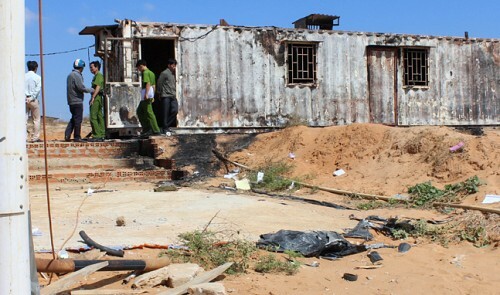 Following these events, the provincial government decided to suspend again the company’s activities, while investigating the circumstances of the factory burning. Consequently, six activists were arrested and charged [1;4]. 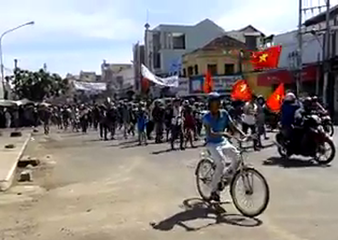 According to online blogs, this provoked that during the following week, thousands of people marched in Thuan Nam district to protest, demanding the release of the 6 arrested people [2; see also 4]. The protesters clashed against the anti-riot police, producing violent fights and injuries on both sides . Project Details Quang Thuan company was granted an 83.7ha mining permit to explore, mine and process titanium-zircon ore in the Thuan Nam district . No information on banks involved could be found. No production data was found.